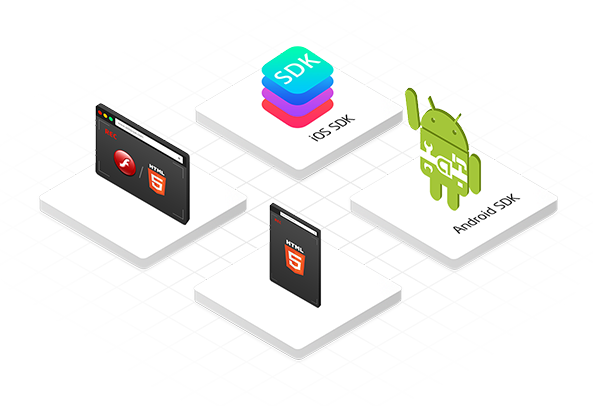 Pipe's new HTML5 & legacy Flash clients handle the recording process from both the mobile and desktop web while the iOS & Android SDKs make it possible to add video recording to your apps and link them to Pipe's processing infrastructure. The recorder client is quickly delivered through Amazon's CloudFront CDN from the closest of 96 physical locations around the globe. We start to stream the data back to our media server as soon as the user starts recording. If he has a high enough upload bandwidth there will be no upload time at the end. HTML Media Capture is used to record video from mobile devices using the OS' capabilities & upload it to our processing infrastructure. Pipe can record and properly manage videos up to 4k (3840x2160) in resolution from mobile devices and up to 1080p from desktop devices. The recording clients are avb. in English, French, German & Spanish. You can also use your own custom language file. Add video recording to your mobile app and link it to our video processing infrastructure through our native iOS & Android SDKs. Pipe can now record audio only files from desktop browsers and Android devices. iOS devices can not record audio only, just audio+video. We've implemented a picture in picture mode for video playback to solve Firefox's camera privacy dialog's lack of persistence. If the user's connection completely fails while recording we take the streamed recorded data and attempt to process it. Your recordings can be automatically recorded to and processed by our EU or US servers for faster uploading and compliance with data protection laws. Your users can now upload existing audio and video files through our new desktop video recorder. Capture the user's screen and enable new use cases in tech support, qualitative marketing research and sales. We've recently made our desktop HTML5 recorder fully controllable using just a keyboard. You can easily TAB your way to completing a video recording. Flash-free audio & video recording powered by our new 2nd gen HTML5 recorder will work on Chrome 63+ and Firefox 50+ from secure origins (https). If the streaming connection from the HTML5 recorder to our media server fails during recording we'll attempt to reconnect 30 times, behind the scenes, while the user is recording. You are NOT a film editor! 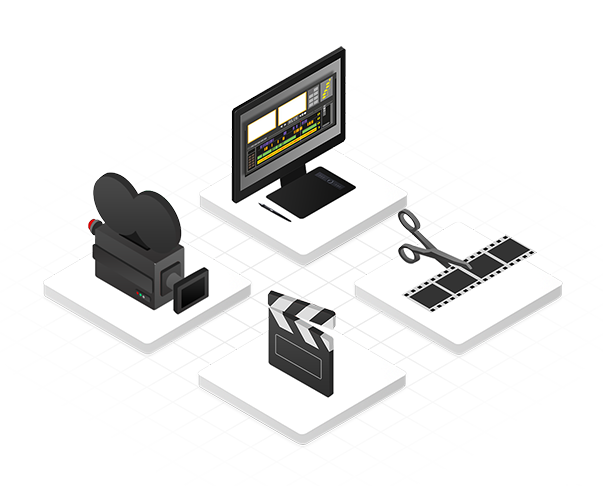 The final .mp4 recordings files we produce contain the right audio and video codecs and are encoded at the right level to play natively across browsers, desktop players and devices. We also extract a snapshot, place a keyframe at the beginning + the MOOV atom before that and add a watermark to any corner if needed. All incoming videos (.mov, .flv, .3gp, .webm, etc.) are transcoded to a fine tuned .mp4 file which plays across browsers, devices and desktop players. With the Pipe PRO account you can easily add a PNG watermark to any corner of your videos. Not available with Standard or Trial accounts. A snapshot is extracted from each video to make it easy to identify and embed the video later on. The device rotation is taken into account to make sure the resulting .mp4 and .jpg snapshot play in the correct orientation across devices. Pipe places the famed MOOV atom at the beginning of the .mp4 file to ensure immediate playback over the web. Pipe tries as much as possible to place a keyframe at the beginning of the video to ensure playback does not start with a black frame. We can store the audio & video recordings for you but if you need more control over the storage, Pipe can securely push the files to your server through SFTP, to your S3 bucket, to your Dropbox account and even to your YouTube channel. By default we store all recordings and their snapshots on our own S3 buckets in the EU (Frankfurt) or US (N. California). Pipe can push the recordings & their snapshots to any of your S3 buckets. Folders and (canned) ACL options are supported. Pipe can also use FTP and SFTP to push the processed recording & snapshot to your web/storage server. With the DO NOT STORE toggle turned on recordings are never pushed to our storage, only to yours. Use the Dropbox integration to be immediately notified about & immediately access new recordings on all of your devices. Videos can be individually pushed to your YouTube channel from your Pipe account area. Our new 2.0 embed code makes it easy to embed multiple recorders into your (single page) web app using HTML or JS. Webhooks instantly provide data about new recordings to your server side scripts while the REST API provides long term access to your data. Quickly add Pipe to any web page or single page app with our easy to use but powerful HTML and JS embed codes. You can setup webhooks to fire on 6 different Pipe events. Each event has it's own data that's POSTed to your server side receiving script. The JS Control API allows you to hide the native Pipe UI and implement your own custom HTML interface. Not avb. on mobile. The Pipe recording clients can be integrated in terms of functionality but also in terms of size, colors and design. Gives you instant programmatic access to all your recordings and account data in JSON format via GET,PUT & DELETE. Take action in the browser as soon as something happens in the recorder with the desktop and mobile JS events APIs. View recordings, generate embed codes, manage storage options, view logs, create environments and more with just a few clicks from the Pipe account area. Through the Pipe account area you have immediate access to all your recordings and their metadata. All dates and times are shown in your time zone. You can change the time zone at any time. Keep recordings and settings separate between your websites, projects, clients or between dev, QA and production. Lots of metadata is stored with each recording: resolution, ip, length, user agent, codecs, device names, etc. .
Did a push to (S)FTP/Dropbox or S3 fail? Find out why right away with our easy to filter & find success and error logs. We've taken great care to make our account area intuitive to use but also to explain in detail all account & environment settings. You'll get an email for each new recording with a snapshot + details about the newly recorded video or audio file. If you record past the included monthly quotas you can rely on our granular usage information to control your costs. If you're from the EU, or you're not from the EU but you're processing data of data subjets in the EU, you can rest assured as our platform will help you comply with GDPR requirements. We've went through the compliance process ealier this year in relation to both the data we process for you as processors (recordings, metadata, snapshots) and data we hold as controllers. You should check out our GDPR overview page for more information on how we help you comply and feel free to email us any GDPR related questions at hello@addpipe.com. The audio & video data is always encrypted in transit from your users to our media servers and all the way to our storage. 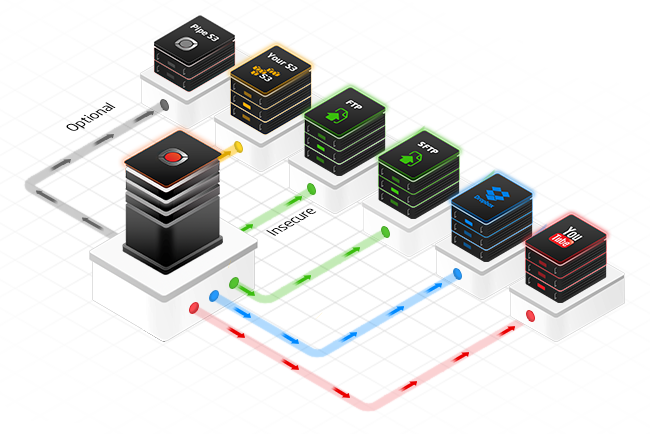 Playback from our storage and data flows to and from our REST API are also encrypted in transit. If your website is delivered over https our recording client will also be delivered over https. Our desktop HTML5 recording client uses a secure wss connection to stream encrypted data over the public Internet. Our desktop Flash recording client uses a secure rtmps connection to stream encrypted data data over the public Internet. Pipe automatically signs all POSTed webhooks so you can verify on your end that the data is coming from Pipe and not a third-party. The recordings are securely pushed to our EU & US S3 buckets, to your web site (through SFTP) or to your Amazon S3 bucket. Playback & download from our EU & US Amazon S3 storage buckets is done securely through https. Our prebuilt integrations and tutorials make it easy to jump start using Pipe with 3rd party software. The Pipe embed code works when pasted directly in WordPress' editor (in text mode). 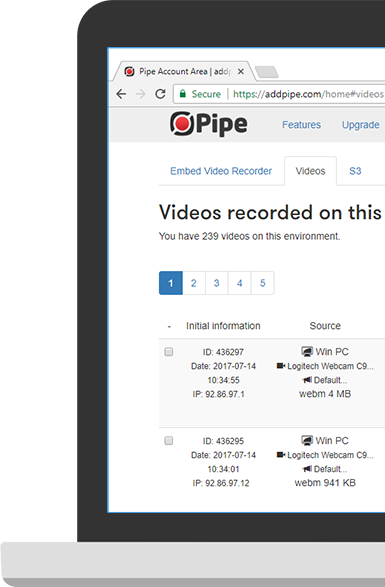 The Pipe Video Recorder Plugin for WordPress allows you to generate short codes for your WP website, embed the Pipe recorder throughout your blog posts and pages using the short codes and review recorded videos and their author directly from the WP backend. The official Gravity Forms Pipe Add-On allows you to add video recording to your GF forms directly from the GF plugin. The Pipe Add-On is now available via the Add-On installer within Gravity Forms. The Pipe Add-On is currently only available to Gravity Forms Pro & Elite license customers. The tutorial we wrote for the popular Gravity Forms WP plugin shows you how to add the Pipe video recorder to a form generated using GF and collect video recorded input together with your form submissions. Works with all GF licenses. The tutorial we wrote for the Ninja Forms 2.9 WP plugin shows you how to add the Pipe video recorder to a form generated using Ninja Forms and collect video recorded input together with your form submissions. Whether you want to build a signup form, a contact form or a more complex questionnaire or qualitative survey that includes video responses, this tutorial will show you how to to do that using Formstack forms and the Pipe video recording platform. Both Pipe Standard & PRO can push the final audio & video recordings (.mp4) and snapshots (.jpg) to (a folder in) your Dropbox account. You will be notified through Dropbox's push notifications and you'll be able to download and play the video on any device that supports Dropbox. Once a video has been recorded and processed it can be pushed to your YouTube channel directly from your Pipe account area. Pipe can automatically push all processed audio & video .mp4 recordings (and their .jpg snapshots) to your own Amazon S3 bucket. All regions are supported and you can specify a folder and/or canned ACL. To set up the push to S3 go your Pipe account area. Creating Qualitative Surveys With Video Responses is now easier than ever with SurveyGizmo and Pipe.